It was refreshing to see the word “spiritual” surrounded by quotation marks in this post from the British Psychological Society Research Digest on the effects of psychedelic drugs. As I have previously argued, there is a lot of nonsense written about drugs generating “spiritual” experiences, most of which can simply be explained by the pre-existing beliefs of the participants. If you experience a wild trip you are going to interpret it in religious terms, or not, based on whether you are religious, or not. What does this tell us? Probably not much. On Friday, I published the results of a study that have been gestating for many, many years. I’ve wanted to look at this issue ever since I first read Richard Dawkins’ The Selfish Gene in an animal behaviour course back at the University of Stirling in the late nineties (pause to feel old). 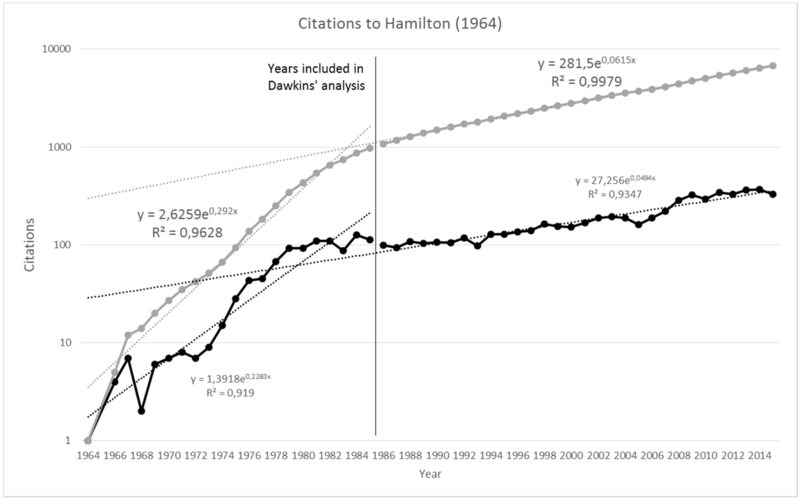 Briefly, Dawkins looked at the citation rates of key papers in the development of the gene-centric view of evolution that he himself championed. It was a neat study and the data he presented seemed to support the argument he was making but, somewhat frustratingly, this analysis was not updated in the third edition, released to coincide with the 30th anniversary of the the book in 2006. At the time I remember wondering whether another 20 years of citation data might have changed Dawkins’ conclusions and when I heard about the upcoming release of the 40th anniversary edition, it reignited my interest. I waited to see whether the analysis had been updated with citation data from the subsequent three decades and was mildly pleased to see it still hadn’t, as it gave me something to write about! I published the paper at the relatively new, gold open access journal Publications from open access publisher MDPI. The peer-review process was thorough and the reviewers clearly knew their field and after some revision the paper was accepted, at which point things went into warp-speed and the paper was available online within 48 hours, after a proof-read by myself. Amazingly, almost immediately after it was published, I received an email from CrossRef saying that they had received notification that I had published something and would like to auto-update my ORCID record with information about it. This was a great example of cross-plaform integration in action, with the publisher including my ORCID alongside the traditional citation metadata. I wish more of my academic colleagues were more open to Open Access, but sadly they are still concerned only with publishing in traditional, closed-access journals because those are the journals with the highest impact factor (although everyone seems to agree that the impact factor is hogwash). This simply perpetuates the monopoly enjoyed by a few publishing houses on intellectual property that is generated by, reviewed by, edited by and used by academics that are largely working for free. The internet is now several decades old and yet we are still no closer to consigning traditional subscription journals to the scrapheap of history. And it is largely the fault of game theory amongst us Selfish Academics. Ikke hvert år biblioteket bidrar med publiseringspoeng på @HandelshoyskBI. I 2017 gjør vi det https://t.co/ykr9esDU62! Gratulerer, Craig! This Autumn saw the release of Ridley Scott’s best film for a very, very, very long time. The Martian, based on the book of the same name by Andy Weir and possibly the hardest of hard-science ever put on film is very different from the pompous and nonsensical Prometheus and I loved both the film and the book. However, while following the media circus surrounding the film I have to admit that I was surprised at the almost universal, uncritical display of faith in NASA’s commitment to dashing heroics in times of crisis. In his interview with the BBC’s Simon Mayo, Director Ridley Scott seemed to be unswervingly of the impression that, should an astronaut be left stranded on an alien world, NASA would surely leap into action at once with a cunningly-devised rescue mission and spare no expense to bring said astronaut home safely. The same “can-do” attitude displayed by NASA in the film is considered key to it’s success by writer Simon Ings in his New Scientist review. As much as I loved Andy Weir’s book and Ridley Scott’s film, the problem with this aspect of both the book and the film is that NASA has an exceedingly patchy record in this respect. We’re all familiar with the efforts expended by NASA bods to bring back the crew of Apollo 13 but despite employing some of the cleverest boffins in all boffindom, NASA’s management have, on two notable and well-documented occasions, ignored the advice of their boffins and adopted a la-la-la-everything-will-be-fine style of crisis management that involved nothing more complex than crossing their fingers and hoping for the best. In the same way that they had been warned repeatedly of the potential for the accident that subsequently destroyed Challenger, NASA management were also warned of the possibility that Columbia might have been damaged on take-off. In the case of Columbia, rather than warn the crew, investigate the damage and prepare a daring orbital rescue of the crew on board, they took the decision to assume that everything was hunky-dory until the fireball streaking across the sky suggested that it wasn’t. This glaring mismatch between NASA’s reputation as gaffer-tape-weilding improvisers extraordinaire (reinforced by films like Apollo 13 and The Martian) and the reality of their mishandling of genuine crises did not spoil my enjoyment of the book, nor the film, but it does reinforce to me one crucial thing about both: no matter how hard the science, they are both works of fiction. Problem II: Science, or the lack of it. As I have previously blogged for British republican lobby group Republic, Prince Charles likes nothing better than a bit of quackery and personally profits from selling ineffective alternative therapies. Like all the Royals it seems, he is a big fan of alternative medicine. Charles is a longtime supporter of alternative therapies and has worked hard to place them on a footing equal to conventional medicine. He established the Foundation for Integrated Health (later re-branded The College of Medicine in the wake of an accounting scandal) to lobby for the “acceptance” by the medical establishment of alternative medicines. The Foundation published leaflets, distributed to every British GP by (amazingly) the UK Department of Health, advocating alternative therapies and suggesting that they have benefits equal to or beyond those of conventional treatments. Alternative medicine debunkers Simon Singh and Edzard Ernst condemned the booklets as “propaganda” and pointed out in their book “Trick or Treatment” that the Foundation’s leaflets simply stated that alternative means were “used to treat” certain conditions, thereby avoiding any discussion over whether such treatments are actually effective. Charles has (ab)used his position to personally lobby the Medicines and Healthcare products Regulatory Agency (MHRA) shortly before it relaxed the rules governing labelling of homoeopathic products. He has also personally lobbied Andy Burnham, the then Secretary of Health, on the subject of making alternative medicines (such as those sold by his Duchy, I presume) available on the NHS. But it’s not just the future king of England that’s the problem. Sir John Weir, then royal physician, used the funeral of George V to prescribe homeopathic “remedies” to three kings and four queens, and the Royals fell for it hook line and sinker. The Queen’s dad, George VI, facilitated the inclusion of homeopathic hospitals within the newly created NHS. He named one of his racehorses Hypericum after a homeopathic remedy for depression. The Queen herself bestows immense respectability on homeopathy. When travelling abroad she is said to lug a case full of sixty vials of homeopathic remedies (i.e. water) around with her. In 2005, the Royal London Homeopathic Hospital (RLHH), of which the Queen is patron, was refurbished at a cost of £20 million to the taxpayer. It costs us £3 million a year to run, and receives further funding from Primary Care Trusts that refer patients. To all of which, depending on your gullibility index, you might respond: So what? Nobody ever died from taking a herbal remedy, did they?. Really? Tell that to the thirty-odd people who died in the 90’s from the form of kidney failure that became known as “Chinese Herb nephropathy.” Tell that to the people who have died from stokes after visiting their chiropractor. Tell that to the people who have had vital organs and tissues punctured by acupunture needles. Ergonomics is the application of scientific knowledge to the improvement of people’s working lives – yet the future king of England (and probably the current monarch) holds some of the most unscientific, and in some cases downright anti-scientific, prejudices ever expressed (or diplomatically not expressed). Alternative medicine shennanigens aside, the Royal family claim a divine right to rule, and this also sits uneasily with my rationalist view of the world. I am an atheist and a secularist and disturbed by the continuation of the fantasy that Britain is a Christian country, which is partly reinforced by the fact that the head of state is also the head of the Church of England. I have now corresponded with several members of the IEHF leadership and there seems to be an assumption that chartership is, by definition, a good thing. However, from what I can tell chartership seems to be a very lengthy, laborious, archaic and potentially expensive undertaking that will forever associate the Institute with a dynasty of quacks and loons. I can see very little sign of discussion of its merits or otherwise in the IEHF’s publications, or even a clear explanation of what it means for the membership. Sadly, the closer we get to being the Chartered Institute of Ergonomics & Human Factors, the further away I get from renewing my membership. I probably should have done it a lot earlier, but life in the private sector goes a mile-a-minute and I simply haven’t had time in between the seven – count them – trips to south-east Asia that I’ve made in the last 18 months. Anyway, here it is: I’ve finally got around to collecting together a list of my publications, replete with links, and you can find it here. A few months ago I wrote my first book chapter along with the very talented Ben Thompson, one of my ex-colleagues from McGill. Writing a book chapter is worlds away from writing a journal article. Your average academic journal articles, especially regarding anything halfway controversial can end up as a pretty dry, compromised effort after the obstacle-course of peer-review has been navigated. A book chapter, on the other hand, allows you to survey your field from a reasonable height and be a bit more opinionated (anyone who knows me even a little bit will realise my attraction of this aspect of the process!). There is also room for that rarity in scientific publishing, humour. InTech is an open access publisher of scientific books and journals and the book in question, Visual Cortex: Current Status and Perspectives is available FOR FREE in it’s entirety. It was a thoroughly enjoyable experience and I am very pleased with the resulting chapter Visual Motion: From Cortex to Percepts. Open access books? Quick-buck-making enterprise or future of scientific publishing? Since I had such fun writing it, I’m not sure I care right now! As promised in an earlier post, my article on the field of neurotheology Neuroscience for the Soul is published this month in The Psychologist. The burgeoning field of ‘neurotheology’ or ‘spiritual neuroscience’ attempts to explain religious experience and behaviour in neuroscientific terms. Research in this field can swing erratically between the extremes of rigorous science and the fringes of pseudoscience in a perplexing and sometimes downright odd way. This lack of quality control stems mainly from the fact that it is a field that polarises opinion – due to the cosmic significance attached to each and every research finding, no matter how trivial, that emerges from the confines of the laboratory. This article plots a course through such research, asking whether there is a ‘neuroscience for the soul’.